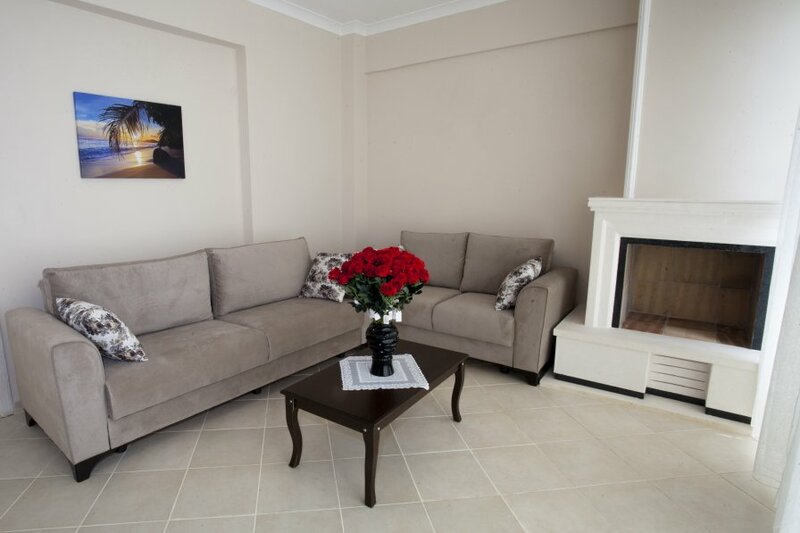 The apartment has five large Luxury Duplex Apartments with a 60 sqm pool with Jacuzzi in Kargi near Fethiye on Turkeys stunning Turquoise Coast 50 minutes from Dalaman Airport and 30 minutes from the beautiful golden beach of OluDeniz where the best paragliding in the World takes place. Kargi is a peaceful village with amenities including shops, cafe, pharmacy, bakery and a large weekly market. Kargi is surrounded by panoramic views of the pine forest and mountain tops but only 10 minutes drive to Calis Beach. Due to its excellent access Kargi is very much an investment hotspot. There are also numerous places of historical interest within easy distance such uas Kaya Köy, Keçiler, Lycian coast. Also many local walks and activities for those who want more than relaxing by pool. Bedroom 1: Family Bedroom – air conditioned,1 double bed, Wardrobe, dressing table, bedside table, and hairdryer. Kitchen: Modern design kitchen which is fully equipped with Refrigerator, Microwave Oven, Dishwasher, Washing Machine, Oven, hob, Kettle, 6 Seater Dining Set, Pans, Pots and cutlery are available. Bathroom towels and bed linen included. If you are staying for more than one week then the apartment will be cleaned and linen changed. If you require extra cleans and linen changes then these can be arranged at a fee. Other information: All the power bills included the rental price. Please bring your own beach towels if you require them.